0.394" (10mm) long x 0.394" (10mm) wide x 0.020" (0.50mm) thick, N50 Rare Earth Neodymium Square Magnet, Magnetized through the thickness. Nickel Plated. Minimum Order Quantity (MOQ) = 15 for this part. About Mid-Sized Square Magnets: Defined with a length between 0.251” (6.375mm) - 0.999" (25.375mm). 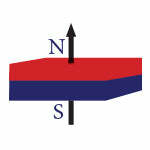 The surface area will determine the reach and profile of the magnetic field and performance of the square magnets.